Imaam Ja'far us-Saadiq (AS) has said, “For every obligatory prayer (five daily prayers), there are two periods of time during which the prayers can be performed, the beginning and the ending. The beginning time is more favorable and it is not permissible that an individual should accept the ending time of the prayer as a proper time for offering Namaaz, because the ending time is intended only for those who are sick and diseased or for those who has a valid cause. To offer Namaaz at the beginning time of prayer pleases Allah and the Namaaz offered at the ending time is to seek forgiveness from Allah; and to seek forgiveness is only when one is at fault. The fault or deficiency is that the man prays at the time other than the beginning time. Indeed, the beginning time which he missed was better for the man to offer his prayers than to spend that time with his family or his preoccupations. Imaam Ja'far us-Saadiq (AS) has said, ‘The commencement of the period for offering the Namaaz of zohr is the declination of the sun towards the west.' 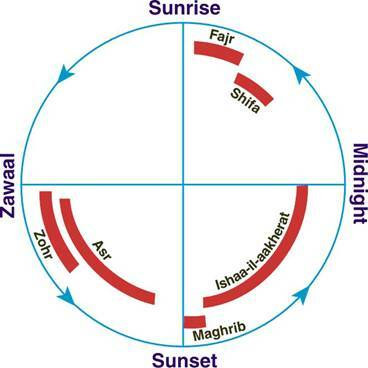 When the sun declines from the meridian, the time of both the zohr and ‘asr prayers starts simultaneously. There is no harm in offering the Namaaz of ‘asr immediately after zohr. The time of zohr lasts for two hours after the declination of the sun towards the west. The time of ‘asr begins simultaneously with the time of zohr i.e. with the declination of the sun towards the west. The obligatory prayer of ‘asr should be offered immediately after the prayer of zohr because this is the beginning time of both the prayers zohr and ‘asr. The time of ‘asr prayer lasts for about four hours after the declination of the sun or another sign for the last time of ‘asr is when the sun loses its brightness and turns yellow. It is related that, ‘Once upon a time Imaam Mohammad Baaqir (AS) went to a hillock with a companion where he ascended and descended. Then, the Imaam (AS) inquired whether it was past midday or not? His companion replied, ‘the sun has begun to decline'. So, the Imaam (AS) gave a call to prayer and stood near a palm tree and offered six rak'ats of sunnat of zohr. Then he said the iqaamat and went to another tree and offered the farz (obligatory) prayer of zohr. Then the Imaam (AS) went to another tree and offered sunnat of ‘asr prayer after giving a call to prayer and then offered the obligatory prayer of ‘asr with his companion. Between those two prayers of zohr and ‘asr, there was no interval except for the sunnat or supererogatory prayer . There is only one time for the maghrib prayer – contrary to the beginning and the ending times of other prayers. Therefore, the obligatory prayer of maghrib is offered first followed by the sunnat. The time for the maghrib commences immediately after the setting of the sun. This means when the disc of the sun disappears on the horizon without the interruption of human vision by a hill or a wall or any such thing obstructing the view of the setting sun. Accuracy of the time of maghrib is like an edge of the sword. The real sign of the sunset is when the redness of the eastern horizon begins to recede and it starts becoming dark. The time of the ‘Ishaa il-aakherat begins when the twilight disappears i.e. it begins immediately after the maghrib prayer. Twilight (shafaq) is the reddish or faint glow which persists after the sunset in the western horizon. Other sign for the time of ‘ishaa il-aakherat is when there is total darkness in the eastern horizon. The time of ‘ishaa il-aakherat ends with the midnight . The time for the midnight prayer (nisf il-layl) and the two rak'ats of istiftaah begins at the midnight or six hours after the maghrib prayers. The supererogatory (naafelat) prayers before midnight can be offered only after one has completed his obligatory prayer of ‘ishaa il-aakherat, if one wishes to do so. Imaam Mohammad Baaqir (AS) has said, “Allah does not accept the supererogatory prayers until after the obligatory ones have been offered.” It is just like when you have missed or lost a day of fasting in the month of Ramzaan, you cannot observe any supererogatory fast until you complete the loss of the obligatory fast. The same thing applies to the prayers. The one who intends to offer the naafelat prayers before midnight , after he has completed his obligatory prayer of ‘ishaa il-aakherat, can offer any two-two rak'ats of naafelat prayers (even those two rak'ats which are offered in the Laylat ul-Qadr) except the midnight and two rak'ats of istiftaah prayer. If one wakes up after midnight and intends to offer the prayer, then he can offer the twelve rak'ats of tahajjud till the time of shifaa. He cannot offer the midnight or istiftaah prayer. You can offer the two rak'ats of shifaa after Nisf il-Layl or after the supererogatory prayer of night, or in the last part of night i.e. an hour and half before the dawn. The prayer of witr and juloos is to be offered after the two rak'ats of shifaa. The sunnat and farz of the Fajr prayer should follow the prayer of shifaa. You should not offer any other prayer between the shifaa and the obligatory prayer of Fajr. The last time for the shifaa prayer is when the light gradually begins to get brighter at the place where the sun is about to rise like the light of the lamp. This is the break of the dawn. Then the light spreads on the horizon to the right and the left. When this stage is reached, it is called the actual Fajr and this is the first time or earliest time for the Fajr prayer. If the call to the fajr prayer has been made and you have not offered shifaa prayer, then you should offer the delayed prayer of shifaa followed by the sunnat of fajr. The time of Fajr terminates when the western sky becomes reddish; this is prior to the time when the rays of the sun emerge, even to the slightest extent, on the eastern horizon. It is not meritorious to delay the saying of Fajr prayers till this time without any valid reason or illness. If you miss the obligatory prayer of Fajr, then you should offer delayed prayer after the sunset or in the time of supererogatory prayers by saying “Azza wa jalla qaza'an” in the niyyat. Above is the graphic image of the timings of the Namaaz represented in a circle to get a clear understanding.  There is no prayer in between the sunnat and the obligatory prayer of Fajr. You can offer two rak'ats of Tahayyat ul-Masjid if you have entered the mosque during this time.  There is no prayer in between the obligatory prayer of Fajr and the sunrise. If you have offered the obligatory prayer of Fajr and missed its sunnat, then you should offer the delayed sunnat (qazaa) after the obligatory prayer of Fajr without giving a call for it (without saying azaan).  You should offer the missed prayers after the ‘ishaa il-aakherat prayer. Instead of saying the word “adaa'an” in the niyyat you should say the word “qazaa'an”.  You should not offer any missed prayers between the fajr and zohr prayers and also between ‘asr and maghrib prayers. Exception to this rule is the prayer of funeral and eclipse.  Imaam Ja'far us-Saadiq (AS) has said, “If you have completed the ‘asr prayer and then recalled that you have forgotten the zohr prayer, then you should treat the prayer that is already said as the zohr and pray the ‘asr. If you have forgotten the maghrib and completed the ‘ishaa, then you should first pray the maghrib and then the ‘ishaa again.  The act of praying to Allah plays an imperative role for attaining eternal happiness and reward for the one who has love for the Ahl-e-Bayt (AS) in his heart. We are bestowed with the choicest blessings of Allah, that He has chosen us among the faithful of Ahl-e-Bayt (AS) and He has succeeded us both in this world and in the hereafter. Offering the obligatory five time prayers is an ‘perceptible' or ‘open' worship (‘ibaadat-e-‘amaliyah ) while having faith, gratitude, and love for the Ahl-e-Bayt (AS) is a ‘veiled' worship (‘ibaadat-e-‘ilmiyah) which is in our heart. And the one whose heart is sound will obviously have his open deeds and actions sound. Thus, having love and devotion for Ahl-e-Bayt (AS) makes all our ‘appreciable' deeds and actions in the form of obligatory prayers complete and regardful. Copyright © 2009 alavibohra.org All rights reserved.